Writing things down makes you more likely to achieve or believe them. Does the same hold true for typing? The Solve Media team may have thought, what better place for a brand to post its messaging then where the lettered gatekeeper once stood. It’s valuable, untapped advertising space and, unlike pop-ups and banner ads, demands visitor attention. 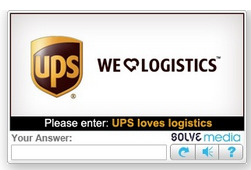 Seems like an effective way for organizations to improve brand recall through online advertising. Visitors don’t have much choice but to study the company’s slogan or ad campaign if they want to see the light at the end of the tunnel, or their account.